Key to understanding the challenge I am about to relate is the opening phrase of the following blog post: “I am still reading”. That’s right, I had not completed my reading of the Occupy Bucharest Manifesto before I was moved to write a post about it. As a result, I offered an evaluation of this document based on an assumption that was incorrect. Instead of this being the compilation of a group’s thoughts, it turned out to be one person’s thoughts, someone who was quick to comment on this blog and reach out to me through Twitter, Luca Oprea. While my premise—that this was a collective product—was premature, my respect for the quality of the ideas and delivery remain true and accurate. Luca is a remarkable thinker, and I look forward to learning more about his ideas and efforts. Occupy Wall Street can be seen as a basic, natural, global response to this fundamentally flawed state of things. The mindless segregation of life and energy flows from human consciousness is what led to the existence of the flowing crowds of Spain and Greece and Portugal and the rest of Europe. They have very little past and no apparent future, and as such cannot be understood through economic theory, although they are created by it. Fundamentally, human communities should cover the full spectrum of evolving life, from primary biological production, through innately collaborative social life, to consciousness and then mind. Instead, the current state of things sees rural and urban areas feeding off of each other in production cycles that deplete the earth, social ties, and individual lives. The reason is simple – while they may appear to be separate and different communities, in fact they are only one community, its production and social flows stretching over very long distances. Capitalism speaks of competition, consumption, business and trade as essential factors which create value, but the reality is that these are low level processes which only make sense between partially developed communities. 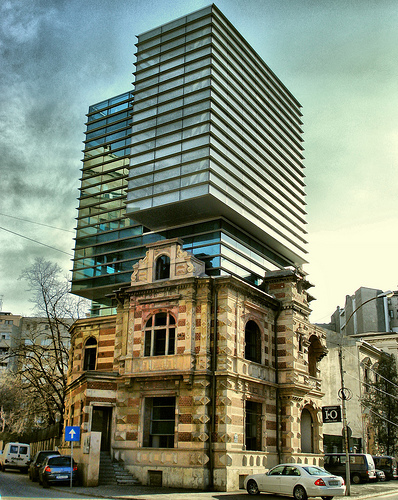 The National Architects Union Headquarters in Bucharest, Romania. Another well-designed manifesto. thought. Cogent, succinct, and nothing short of visionary, that this document was developed by a collective is all the more extraordinary! Have you ever wondered how it was the the United States Declaration of Independence was so well written? The language is refined, focused and accurate, so much more effective and compelling than the majority of all written work of that day, and ever since. I have often tried to imagine the mindset of Thomas Jefferson as he wrote the first draft, the level of concentration of John Adams and the others at they read it and suggested edits. What amazing clarity and understanding! We saw it once again in the US Constitution, but not as much in some of the amendments, and even less in the reams of legislation that have been generated by federal and state bureaucrats ever since. I believe the key difference is in the thinking that comes before the word, perhaps that’s not obvious, given the vast quantities of words with no meaning that are published by the minute. Thomas Jefferson and his colleagues were all focused on an urgent need for freedom from tyranny and how to make that happen, on this they thought long and hard. No doubt, the people in Bucharest spent considerable time discussing what brought them together. The process of writing well—the distillation down to the fundamental issues and then to convey them in compelling words and phrases—is no mean feat. This evidence of those thoughtful conversations tells me that many of the Occupy sites are having similar conversations, and that alone could be enough to justify the movement, in my opinion. As a species, humans do not gather together often enough to tap into the astounding power within their minds. Some points about the dark road where capitalism has taken us will be argued by those who feel it is a perfect system. Regardless, in my opinion the writers of the Occupy Bucharest manifesto have done what few writers, much less groups of writers, have done in recorded history. It is well worth your time to invest in reading this document for understanding. I would love to hear your thoughts on this (to include how long it took you to read it!). The manifesto is not a group work, but rather my own, and it is signed as such at the end. Would I have preferred that it be a collaborative effort? No. Simply because, if you look at the declaration that the original Occupy Wall St group has published after three weeks of discussions, it is one small page of rather ho-hum observations. I don’t believe groups are good at thinking together, and certainly not at creating a strong narrative with a compelling voice. There is a great deal of internal, unspoken work that goes into that. In fact, I wrote the whole thing in about six hours, and posted it unedited (I gave it a quick edit a couple hours ago). That sounds like a very short time, but in fact many months of thought went into – not the manifesto itself – but understanding all these apparently disparate fields and then finding a reason – the reason for which they exist and are relevant. After that it was just a matter of grinding out a text while thinking about who I am addressing. Who needs to read this, and why, and most of all – if I am speaking of a human thing, then it must truly be human, it must truly speak to all but those who would deny it out of hate or strong preconceptions. Whether I managed to do that or not (personally, I think it’s not exactly shining work), it couldn’t have been done as a group. Never ever. Where groups shine is in gathering information and making a million wrong observations, that can form a massive structure you can whittle away at. One mind moves easily through the large forms of the world and the universe, but when it comes to details, many minds must do the job of melding the unstructured into structure, then that structure has to be refined and completed, transcended, if you will, from structure to usable understanding, by very few minds, or just one. This is not an argument for individuality, but rather for intelligence. The higher the minds in the group, the quicker they will move, and the higher the structure they will create. But eventually, somewhere, someone, will have to grind the edge on the sword. And you can’t have 20 people grinding an edge, it’s a mess. If you would like to send me a list of some of the grammar mistakes, I would be grateful for that. I have to apologize! Obviously I never made it to the end of your work or I would have had a totally different take on this epic construct. I am short on time to think through my response; suffice to say I will be in touch, for I sense there is more I would like to convey than the simple respect I can provide right now.